During his remarks at the first session of the 181st Annual General Conference of The Church of Jesus Christ of Latter-day Saints, Church President Thomas S. Monson announced three new temples in Meridian, Idaho; Fort Collins, Colorado; and Winnipeg, Manitoba, Canada. Here are some brief facts about the Church in those areas; additional details on the new temples will be announced as they become available. Meridian is the third-largest city in Idaho and is located about 11 miles west from the capital of Boise. Fort Collins is located in northern Colorado, 57 miles north of the capital of Denver. As of October 2010, there were nearly 140,000 members in the state. The first congregation of the Church in Colorado was organized in January 1897. 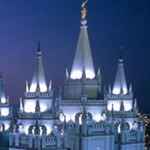 This will be the second temple in Colorado; a temple in Denver was completed in 1986. Winnipeg is the capital and largest city in the Canadian province of Manitoba. It is located in southeast Manitoba, north of the North Dakota/Minnesota border. The temple will serve the needs of members in the Winnipeg area who currently travel for 6.5 hours and nearly 400 miles (600 kilometers) to the nearest temple in Regina, Saskatchewan. This will be the ninth temple in Canada. In addition to the Regina temple, there are temples in Cardston, Calgary and Edmonton, Alberta; Toronto, Ontario; Halifax, Nova Scotia and Montreal, Quebec. In May 2010, Church officials dedicated the Vancouver British Columbia Temple and broke ground for the Calgary Temple. There are currently 134 operating temples worldwide and, with today’s announcement, 26 temples announced or under construction.